Voice search is exactly what it sounds like: using your voice to search for things. In more technical speak, voice search software processes and transcribes human speech into text. It then analyzes that text to detect questions and commands and connects to external data sources (such as search engines and directories) to find the relevant information. Voice search is on the rise, and it is predicted that 50% of all searches will be voice searches by 2020. It doesn’t stop there – about 30% of all searches will be done without a screen by 2020. This means more and more people are using products such as household speakers, like Alexa and Google Home, to read the search results as opposed to looking at a screen. Currently, about 16% of Americans own a voice-activated smart-speaker, and this number is expected to explode. Household speakers are predicted to rise in the US to 55% by 2022, from the current 13% and there will be an estimated 21.4 million smart speakers in the US by 2020. With predictions such as these, it is important that you understand what voice search is, what to expect from it and how to use it to your business’s advantage. Luckily for you, we are breaking it all down in this blog! Voice search is extremely useful, and it isn’t just limited to searching on search engines. Taking advantage of voice search (especially on your phone) is not only fun but very helpful in day-to-day life. These days, people are looking for anything to help save them some time and to make life easier, and voice assistants do just that. Getting directions. Have you ever been driving and need to get directions, but you don’t want to get busted for having your phone out? Just call out to ask Siri, and she will pull them up for you and tell you exactly how to get there. Place a call or text. Ever see people walking around or driving and speaking into their phones with a bit of a monotone? Chances are they are sending a text in an effort to have some free hands. You can also ask your phone to place a call for you, so you don’t have to pick it up, search for the contact or (gasp!) actually have to dial. Check the weather. Are you hurrying around your home trying to leave for work, and don’t have time to open up your weather app to see if you should grab your jacket or not? Just call out to your voice search to get the answer. Schedule a reminder. “Hey Siri, remind me to switch my laundry in 45 minutes.” “Alexa, remind me to call my mom back tomorrow.” It’s like having your own personal assistant! Set an alarm. Similar to setting a reminder, you can set an alarm for yourself without having to scroll around in your phone while you’re half asleep and already all snuggled in bed. Get the latest sports scores. There are plenty of reasons you might not be able to catch the big game, and even more reasons why it’s harder to find and pull up the scores. Just ask your voice assistant to do it for you! Play music. If your hands are full from food in the kitchen, hanging decorations or playing with kids, just ask your voice search to pay a specific song, open up a playlist, launch Pandora or to shuffle an album. You can get the party started without even needing to walk away from a conversation. Open an app. We have tons and tons of apps on our phones these days, and scrolling around on different pages and sub-folders trying to find a specific one can be a little time consuming and frustrating. If you’re in a pinch, just ask Siri to do it for you. You can even take it a step further and ask her what might be new in the app since the last time you opened it. Get your latest notifications. If you heard your phone ding or ring but you can’t open it, just ask what the new notifications are. From there you can go even further and have your phone read a text, email or more. When Do People Use Voice Search? Using voice search when your hands are full is one of the primary reasons it is used – in fact, this is why over 60% of people who use voice search use it. This is obviously because we like to have our information as quickly as possible, even if our hands are otherwise occupied. Not having to type in a search term anymore and scroll around for the perfect result is a great luxury that people are learning to enjoy. More specifically, it’s important to know what types of situations people have their hands full and need to use voice search actually are, in case they are pertinent to your business. Use voice search for faster results. and find the correct answer yourself. Instead, you can just have your trusty voice assistant do the work for you, and all you need to do is tell it whenever it’s read you the right answer. Additionally, people often have difficulty using their devices, whatever the reason may be. It could be due to poor vision, lack of technological know-how, physical inability to use their smartphone or just simply poor typing skills. Whatever the reason, 24% of people who use voice search use it to avoid having to type themselves due to difficulty. An additional 12% use it to avoid having to navigate confusing menus. Another 22% of people use voice search for the simple fact that it is just fun and cool! So no matter what reason you use voice search for, even if it is for no reason at all, it’s great to take advantage of! What Do People Use Voice Search For? In addition to using voice search when our hands are otherwise occupied, there are lots of other reasons people are taking g voice search takes the job of having to Google advantage of voice search. When understanding voice search, it is also important to understand what people use it for the most. Depending on your business, you might want to tailor your marketing efforts to match what these might be. Deals, sales and promos (52%) – Are there coupon codes for Target? What are today’s deals? Overwhelmingly, the number one thing that people use voice search for is to save some money. Everyone loves saving cash by looking for coupons before purchasing something, so make sure you do your best to include a promo with your marketing. Personalized tips and info (48%) – How is the traffic today? What’s the weather outside? All these personalized tidbits come in as number two for things that people use search for. This means do your best to do localized SEO so that you can get as personalized as possible. Events and activity information (42%) – What is the score of the Rams game? What time is This Is Us on? This specific information about events is pretty widely asked about by voice search users, so do your best to tie your marketing in to current events. Business information such as store location (39%) – Directions to the nearest Starbucks? What are Target’s hours? By making sure all your business information is current and up-to-date on your Google and Bing business backends will help you be easily found by people looking for you. Customer service support (38%) – What is the customer service number for Wells Fargo? Call my nearest pharmacy? Asking your voice search assistant to connect to customer service support is important to people, so again, make sure all your business information is up-to-date so that your correct contact info populates. 1 in 4 shoppers used voice assistants in their holiday shopping during the 2017 season. 35.6 million Americans used a voice-activated assistant device at least once a month in 2017. 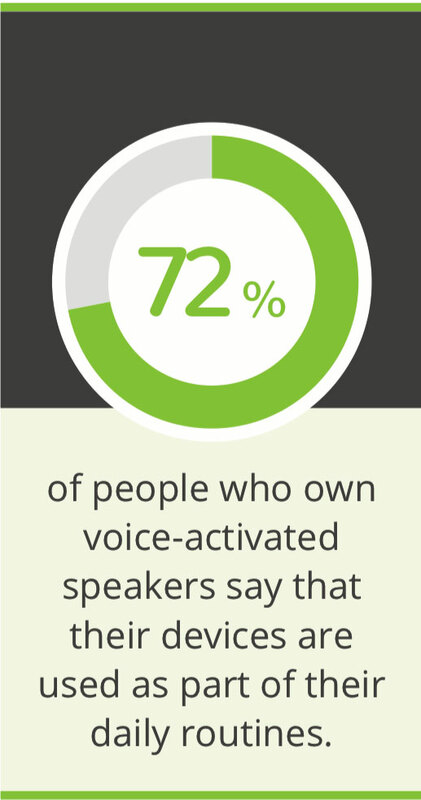 72% of people who own voice-activated speakers say that their devices are used as part of their daily routines. About 1 in 5 adults use mobile voice search at least once monthly. According to an NPR survey, 65% of people who own as Amazon Echo or Google Home can’t imagine life without a smart speaker. 25% of individuals of 16-24 use voice search on mobile. Mobile voice-related searches are 3x more likely to be local-based than text-related searches. 88% of all “near me” searches are done on mobile. Between 20 and 25% of mobile queries are voice searches. What Voice Search Assistants Are Available? There are a handful of voice assistants available for people to use. They all populate search results through various sources. It’s important to understand each one, who makes them and how they populate search results. That way, you and your business are optimized in the best way possible. Google: Google Assistant. Obviously, Google Assistant works by working with your Android phone to populate search results by Google. Microsoft: Cortana. By default, Cortana uses Bing. You can actually switch whatever Cortana bases it’s search off of, so really it is up to the user. However, it’s important to know that Bing is the default. Amazon: Amazon Echo & Fire TV. Much like Cortana, Alexa pulls up search results on your Amazon Echo through Bing. Apple: Siri. Apple uses Google when you use Safari, however, when you ask Siri something – you are actually asking Bing. Starting to see a pattern here? Samsung: Bixby. Unlike some of the other voice assistants, Bixby also uses Pinterest Lens to do a visual search. Point your camera at something, and she can tell you all about it. The voice recognition market will be a $601 million industry by 2019, so it’s important to make sure your business’s SEO efforts are in line with the pendulum swing. Since voice-activated searches can be longer than 10 words, natural language keywords may be the next thing. Limiting yourself to just a couple of words in your focused key phrases can soon be a thing of the past. In addition, using natural language will be more relevant and match with your consumers more, making your ranks much higher. Ready to make sure your business is getting found by voice search? We put together a short list of things that you can start doing today to make sure you are optimized and being found by voice search assistants. Make sure your business is optimized on ALL major search engines, not just Google. Despite being the biggest search engine on mobile and desktop, it is not the default for voice searches. This is due to the programming of these devices, not the consumer’s choice, so just make sure you’re right there with it and still giving your customers everything they need. Go claim all your business pages to make sure all your business information is up-to-date. You can do this by updating all your directory listings and business pages on all the major search engines. Start optimizing local search by understanding the preference in people’s way of voice search. Short, clear, concise questions and statements are most often used. People also enjoy customized information, which local SEO can help you with. Updating all your directory listings is an extremely important step when it comes to SEO. If you need help preparing your online directory listings to be voice search friendly, let us know. We can help!